Hello, thank you for you for your interest in partnering with me here at I’m an Organizing Junkie! 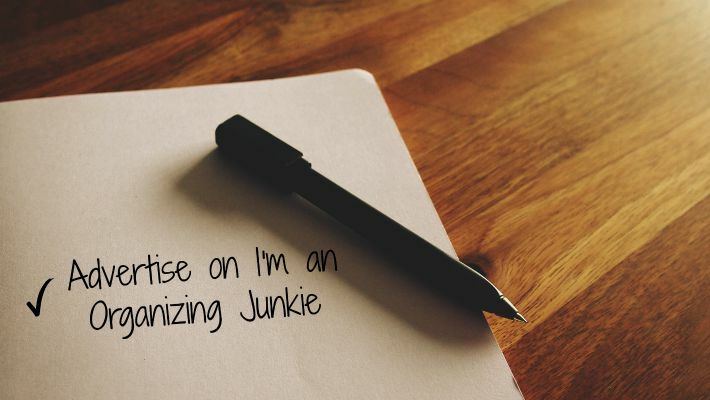 I started I’m an Organizing Junkie 9.5 years ago in May of 2006 and blog about all things related to organizing and simplicity in addition to running a popular weekly feature called Menu Plan Monday. Please keep in mind that while I am a Canadian blogger, my audience is 82% US based and only 6% Canadian according to my most recent stats. In December 2010 I released my organizing book called Clutter Rehab, 101 Tips and Tricks to Become an Organization Junkie and Love It!. I’ve also been featured in the following publications. In addition I was a speaker at the Professional Organizers of Canada Conference in 2008. If you are interested in advertising on I’m an Organizing Junkie and promoting your product to thousands of women I would be pleased to provide you with ad space on my right sidebar. Your ad will appear on my right hand sidebar with a link back to your site. All ads are subject to review and approval and for optimal success preference will be given to those that are relevant to Org Junkie readers. Ad order is based on a first come first served basis. As ad space above yours becomes available your ad would automatically move up. In addition, I offer to my monthly sponsors only, at no extra charge, a shout out in my Sponsor Spotlight post at the end of each month. You can see examples of those posts here. I visit your site often because I love anything having to do with motivation for getting organized – and your site is the BEST! Because I trust you to give us the lowdown on quality products and services, I usually pay close attention to the buttons on your sidebar. One day, I thought to myself, “How can I get ListPlanIt.com in that spot?” After a quick email to you and a prompt reply to me, it was easily set up. I started noticing traffic from Org Junkie right away. In the 2 months that I advertised on Org Junkie, you were one of my top referrer’s! Well worth the very reasonable price. Thank you! Thank you so much for offering advertising on your site! We love working with you and advertising on your blog has been very much worth the investment! Thank you for your wonderful blog and your willingness to help us spread the word about our organizing workshops. 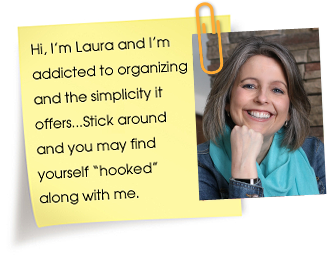 Laura, your site is an amazing resource as well as a great place for us to advertise our professional organizing training program. We get a lot of click-throughs and it has been well worth the investment. You can count on us sticking around for a very long time! Your site is the best! I love finding ways to save time, money and most importantly, my sanity! I am always on a quest to find new organizing products and containers that will do just that, not only for me, but for others as well. I am more than happy to review these types of products and share my reviews of the ones I love. Please note though that sending me a product doesn’t guarantee a review. Products have to pass my tough criteria first and I will only review the ones I adore. I make every effort, by doing my research first, to not accept products that I don’t think will be a good fit. My integrity and the trust my readers have in me is of utmost importance and I won’t jeopardize that. I wanted to take some time and thank you for the awesome review of the Bra Tree! After your review I got more likes on my Facebook page than any other review. Not only did get a lot of “likes” I was flooded with orders for my product and sales increased! Thank you, Thank you. It’s obvious that you have tons of followers and readers of your blog. Thank you for writing about my invention and helping me spread the word to create brand awareness. To create further buzz, I can also provide you with the opportunity to do a giveaway along with your review. Minimum $50 value. Please note vendors will be responsible for shipping to winners. Please inquire via email for my product review/giveaway rates. Additionally, all reviews and/or giveaways will be shared and linked to via my Twitter/Facebook/Pinterest accounts. For further details please don’t hesitate to e-mail me so we can discuss the possibility of working together along with my current site statistics and rates.